You want to feel confident when it comes to who you choose for your Richmond Tree Fertilizer. At C.S. Flournoy it should help that our team includes a skilled, certified arborist on staff. Of course there is more to it than that. With well over 30 years of professional experience in the industry, we know what it takes to get the job done and do it right. What better way to ensure the health of an improve the beauty of your favorite trees than through deep root fertilizing. Younger, smaller trees require fertilizer in order to help them fully develop and reach their full potential. Yet, too often, larger, older and well established trees get neglected. Just because their root system has taken hold doesn't mean they lack the need for care and maintenance. 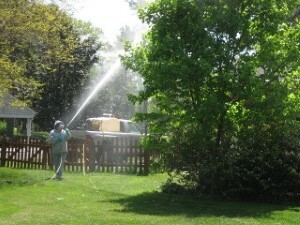 In fact, in order to preserve the health, beauty and longevity of your already established trees, you need to let C.S. Flournoy take care of feeding them as well. Helping all of your trees to be healthy is the best way to ensure that they can stave off concerns like disease and insects. While other methods can be used to help combat these issues, the best method for initial defense is a healthy tree. Let our Richmond Tree Removal Company help you take care of your trees by taking care of professional fertilization. Trees can always use some type of fertilizer to ensure better health. It also generally takes a trained eye to determine which trees are in the most need. However, you can also look yourself to try to determine which of your trees are in the most need. For example, one tell-tale sign is if the new twig growth over the past year is less than two inches, this is the ideal candidate for fertilization. However, if it has been several years since your trees have been fed or you notice that ongoing regular growth is stunted or at a standstill, then it is most certainly time. Although they do sell many products intended for property owners to take care of the task themselves, the results will not be as effective. It is all about having the best products possible for the type of trees and even the type of climate, but also about how to properly take care of this task in order to have effective results. So what are you waiting for? Let's get started today. Let the C.S. Flournoy team take care of your Richmond tree feeding so you can get the most out of your trees. Don't keep putting off until tomorrow what we can take care of for you today. If you are looking for Tree Fertilizer in Richmond then please call 804-264-1000 or complete our online request form.